If we consider only the mechanical aspects of robotic systems they consist of three things, links and joints make up what is considered the manipulator and the end-effector or end-of-arm-tooling is the tool attached the end of the manipulator that does the work. A joint is the connection point b two links that can either rotate around an axis (Rotary Joint – R) or extend along an axis (Prismatic – P). A joint is just like your elbow. A link is a fixed object that does not move relative to itself but can move relative to other links in the robot via a connection through a joint. A link is like your humerous (upper arm). It does not move relative to itself but it does move relative to your forearm via connection through the elbow. The end-effector is the tool mounted to the end of the arm such as a two-finger gripper or a welder. It is the object that the robot is being used to position such that it can appropriately complete the work required. Because R and P joints can be combined in many ways we classify them based on these combinations. Some of the common configurations are below. 1. The Selective Compliant Articulated Robot for Assembly (SCARA) robot is an RRP manipulator consisting of two rotary joints and one prismatic joint. Sometimes this style of manipulator will have a fourth rotary axis or joint mounted to the end of the prismatic joint. These are often used for high-speed pick-and-place applications. Check out the examples below. Notice the fourth axis added to the end of the prismatic joint in the next example. 2. The Articulated Arm is an RRR configuration consisting of three rotary joints and is the most common type of industrial robot used for a large array of different activities. This refers to the first three axes of the robot. In most cases there are three more axes comprising the wrist of the robot for a total of 6-axes or joints. However, in some cases only one or two more axis exist such as in the KUKA KR40A palletizing robot. The 6-axis version is the style of robot we have in the laboratory. Check out the example of this configuration below. 3. The Cartesian Robot or Gantry Robot is a PPP configuration and is also a common type of robot commonly used in machine tending. This robot consists of a large frame commonly resting above or around a large machine such as an injection molder. Check out an example of this configuration below. 4. Another somewhat common robot configuration is called the Delta Robot. It is difficult to describe so check out the video below. 5. Many other configurations or combinations of configurations exist in the market. A common combination is that of the Articulated arm on a single axis gantry such as the KUKA jet. In a robotic manipulator, a cartesian coordinate system can be assigned to each joint through which every movement can be fully described. There is a very specific method developed in the 1950s to assign these Cartesian coordinate systems to the robot manipulator called the Denavit-Hartenberg Method or D-H method. The D-H method is described below. Start at axis 0 at the base of the robot and work towards the end-effector. Each axis will have a x, y, and z-axis labeled xn , yn , and zn where n is the axis number beginning with 0. 1. Begin by selected the z-axis in the direction of the joint axis. That is, if a rotary joint the z-axis extends out of the axis of rotation or if a prismatic joint the z-axis extends along the axis of movement. 2. The x-axis is selected to be perpendicular to both the current z-axis and the z-axis of the previous joint. 3. The y-axis is selected such that the coordinate system complies with the right-hand rule pictured below. 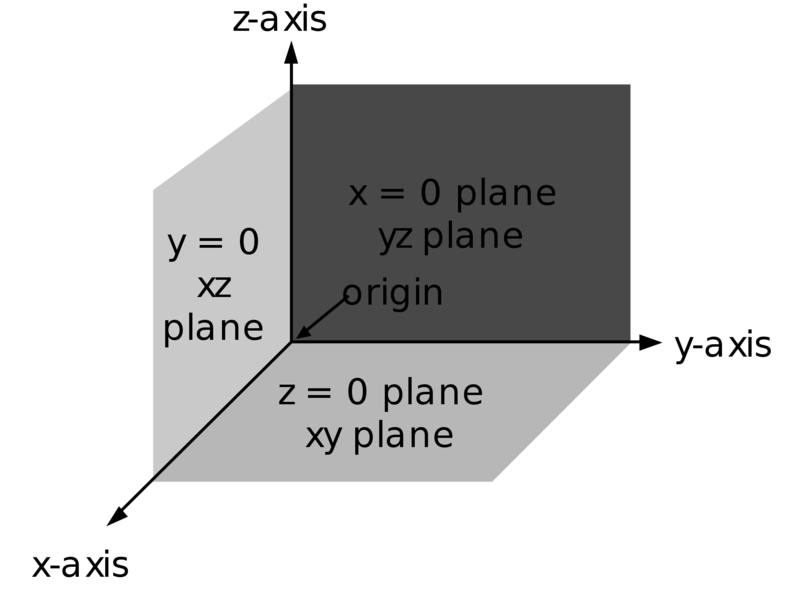 1. d is the “joint distance” and is the distance between the current x-axis and the x-axis of the previous joint along the z-axis of the previous joint. 2. is the “joint angle” and is the angle from the previous x-axis to the current x-axis rotating around the previous z-axis. If the joint is rotary this value is probably a variable. 3. a is the “link length” and is the distance from the previous z-axis to the current z-axis along the current x-axis. 4. is the “link twist” and is the angle from the previous z-axis to the current z-axis rotating around the current x-axis. Here is an example of a coordinate system applied to a robotic manipulator. Once a complete set of DH parameters has been obtained from the chosen coordinate frames a series of transformation matrices must be developed. These matrices serve as a converter of cartesian coordinates. That is, if a point in space is known in x, y, and z with respect to the base coordinate system located at the base of the robot, the first transformation matrix could be used to relate that same point to the cartesian coordinate system located at the first joint in the robot. These transformation matrices are in the form as given below. In the above equation don’t confuse alpha with a. The far right column uses a while the other columns use alpha. Where n begins at 1 and ends at the number of total links in the manipulator. Once all n matrices have been obtained they must be multiplied together to obtain the total transformation matrix. For simplicity the sine and cosine function are often represented by only their first letters, s and c respectively. For a primer or review of matrix multiplication please navigate here. For examples of the DH coordinate system selection and parameter gathering, navigate here. Once the transformation matrix is complete it can be used to relate a point in cartesian space in reference to the base coordinate to a point in cartesian space in reference to the end-effector. Develop the total transformation matrix for the manipulator shown below. Give the value of x, y, and z with reference to the base coordinate system of the center of the last link to which the end-effector would be mounted if Ѳ1=40° and Ѳ2=30°. I have started you off by selecting the coordinate systems for each joint. Hand in your work or drop it in my mailbox. Download the notes at the top of the screen for a better picture of the image below. 1. Consider this point to be x,y,z = 0,0,0 in the coordinate system of the last link. 2. Consider joint 0 to be at zero degrees in the picture and joint 1 to be at about -70 degrees; that is, zero degrees would be rotated away from you by about 70 degrees such that link 1 and link 2 are parallel. 3. 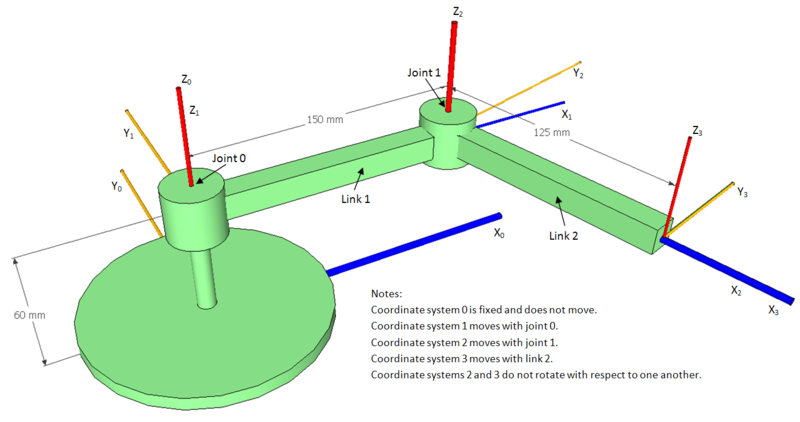 Select the z axis of the base coordinate system to be coincident with the axis of rotation of joint 0 and select the x-axis to be parallel with link 1. I’m not sure I completely understand your question but I’ll do my best. The most common type of industrial robot consists of 6 axes, three on the arm and three on the wrist. In this most popular type all 6 axes are rotary. Do a google search for some of the most prominent manufacturers (KUKA, ABB, Fanuc, Motoman, Nachi, Denso, Adpet, etc.) to see some of these. Feel free to expand on your question, providing more details, and I will try to better answer your question.